A different way of passing the time is emerging inside the Manchester City dressing room as Pep Guardiola‘s players hunt for fresh ways to relax. Benjamin Mendy has introduced the South American dice game, Perudo, to his team-mates and four new boxes arrived at the City Football Academy this week. A hit with France‘s World Cup winners last summer, Perudo encourages high-risk strategies and celebrates the art of bluffing. Both are traits their manager revels in deploying — particularly in the Champions League. Kidology was very much at play before a tantalising double-header with Tottenham, as he sarcastically agreed that not lifting the Champions League would be considered a failure. What he could not dispute is that City need to roll the dice this week. Guardiola described the two home games against Spurs as season-defining. And they have to win them both — on Wednesday night in the Champions League second leg and on Saturday in the league — if a hugely promising campaign is not destined to fall flat. Two wins and the prospect of an historic Quadruple would be solidified by Saturday afternoon. Equally, City’s season might go up in smoke with draws or defeats. The FA Cup and League Cup double would be scant consolation. The message coming from his players is that the Quadruple is firmly in their thoughts. 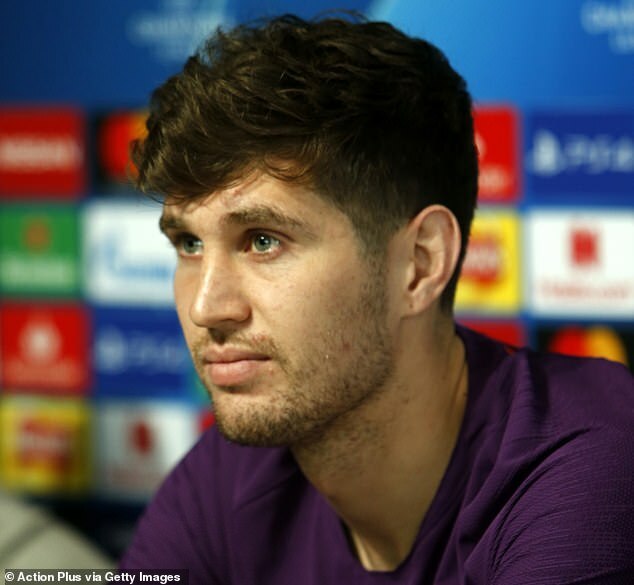 John Stones talked up the squad’s chances, saying: ‘We’re still on for the Quadruple and that’s the dream we want to achieve. We’re fighting for it every day. We’ve got to trust it brings the best out of us. 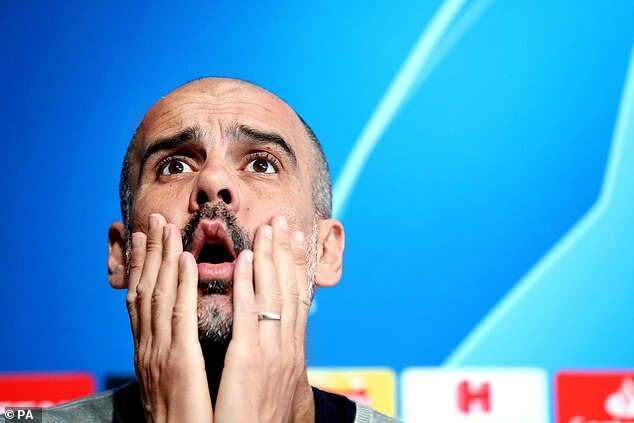 For that to come to fruition, Guardiola will need to win his first Champions League since 2011. The Catalan’s record in the competition is derided by his detractors, particularly a failure to reach a final during his three years in charge of Bayern Munich. There have been big moments when Guardiola has been found wanting in this competition, but also big moments where his genius has been plain. He has won it twice, after all, in 2009 and 2011. One more would put him on a par with Bob Paisley, Carlo Ancelotti and Zinedine Zidane. Some around City believe that starting with two holding midfielders and resting Kevin De Bruyne for last week’s 1-0 defeat at Spurs might also prove to be a masterstroke come the full-time whistle on Wednesday. De Bruyne certainly looked fresh and carried City during the latter stages of Sunday’s victory at Crystal Palace. 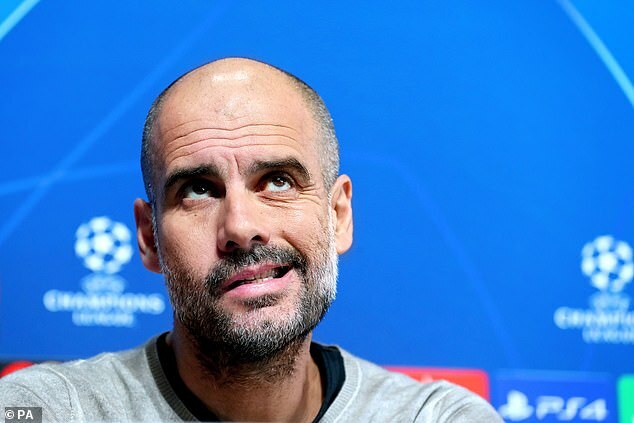 ‘When my teams don’t win the Champions League, they “fail” all the time,’ Guardiola said, eyebrows raised. ‘I have to win. The chairman asked me to win three times in a row. We try to do our best and tomorrow we will see. ‘I know people say I came here to win the Champions League. I didn’t come here to win the Champions League, honestly. Of course I want it. I know at Bayern Munich, a big club, after three seasons winning absolutely everything (domestically), then the Champions League was a big failure. The semi-finals of this competition are still largely uncharted territory for City. Their only appearance was in 2016, months before Guardiola arrived, and that is partly why the manager objects so strongly to questions about his record. He has described City as ‘teenagers’ in Europe given their lack of experience and knows the club’s supporters are not completely engaged because of long-running disputes with UEFA. Despite all that, there is a realisation that this talented squad must now go further. Holding their nerve in big cup matches has not always been City’s strongest suit. I think Pep Guardiola factored in that Manchester City can score more goals at home than Tottenham could at their new stadium. Mauricio Pochettino’s side got one in the first leg but I’m not sure that will be enough to see them through to the semi-finals. For City on Wednesday, it will be attack, attack, attack. As much as I respect Spurs, it is bound to be too much for them to handle. Spurs have pace throughout the team and we know the way Pep Guardiola’s Manchester City like to play. City take risks, and that leaves them exposed to counter-attacks. 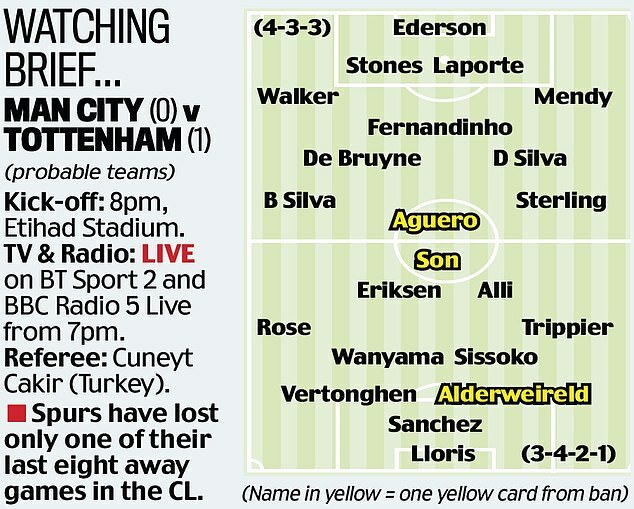 That’s why I think Tottenham will get a goal — but I also think City will score a few as well. Guardiola’s players will feel like they have a point to prove. They will want to show how serious they are about the Quadruple.